Seattle Bootie Seattle @ Neumos — St. Paddy’s Party! Bootie celebrates St. Patrick’s Day with plenty of Irish mashups in the mix! Bootie celebrates the Emerald Isle with our St. Paddy’s Party, where everyone’s a little bit Irish-ish! 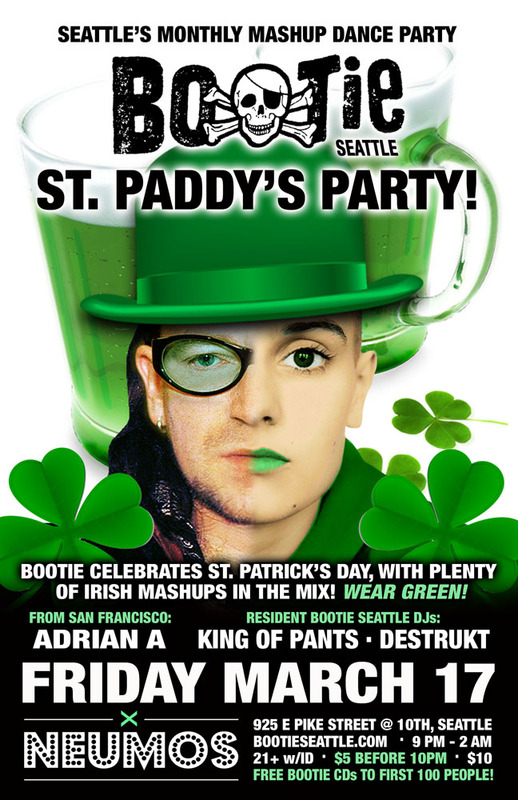 Keeping the party bumping until the leprechauns come out will be Bootie co-creator Adrian A., coming up from San Francisco to join Bootie Seattle resident DJs King of Pants and Destrukt as they throw some special Irish mashups into the mix, helping to make sure that everyone gets their jig on!